Danzas Aztecas coming into camp in North Dakota with their colorful regalias to show support to protectors. Thousands of people, including members of over 300 Native American tribes, have gathered at a camp site near Cannon Ball, N.D., to join the growing protest against plans to install a pipeline that would carry crude oil through Standing Rock Sioux sacred land and possibly threaten their water safety. 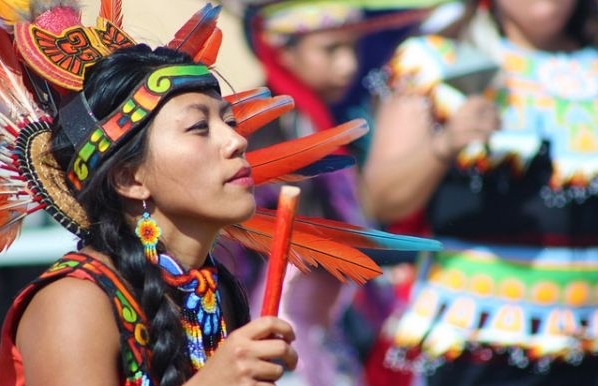 Hundreds more are gathering in cities across the nation, including in Philadelphia. .
As a part of the tradition, the dancers are dressed in elaborate and colorful head-dresses that mimic birds..
"Our regalias represent the different elements of life," Salinas said. "Each outfit is dedicated to fire, water, earth or wind." . Aztec Dance is concentration in motion. One can almost look at this as a way of meditation with movement. The dancer’s concentration on the movement and steps could channel the offering to the god as well as focusing on their goals of prayer. . Ritual dance is known as Macehualiztli, which translates to “deserving.” The dance represents the eternal search of man for cosmic harmony and integration of body and spirit. It is considered a form of prayer, but also a complete way of life and communication with what was most important to these people, their gods. .
Aztec Dance is one of the most basic expressions of artistic and cultural spirit of the native people of Mexico. For the Aztecs this tradition is a part of life, and fortunately we are able to see this fascinating way of life today.. 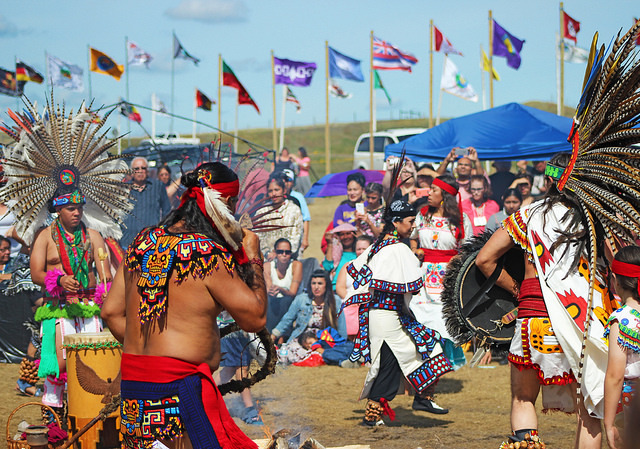 Responses to "Aztec dancers bring culture and support to North Dakota "
President Obama needs to stop sitting on his hands and STOP THIS NOW. I THINK THIS SHOW OF SUPPORT IS FANTASTIC. I ALSO ENCOURAGE SAFE KEEPING WITH YOUR CHILDREN, AWAY FROM THE POLICE AND MILITIA WHO DON'T CARE ABOUT THEM. BEST WISHES ALL AND TO THE END OF THIS TRAVESTY AGAINST NATIVE'S RIGHTS, LANDS AND WATER! United they stand, all the nations, this is their worst nightmare. #Solidarity with those at Standing Rock from Brisbane, Australia.